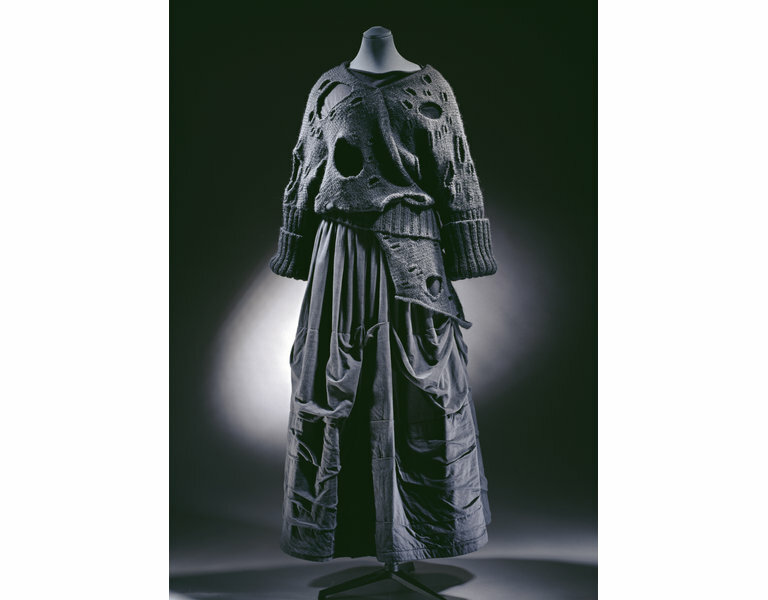 This black ensemble (T.167 to C-1985) was designed by Rei Kawakubo for Comme des Garçon in 1982. 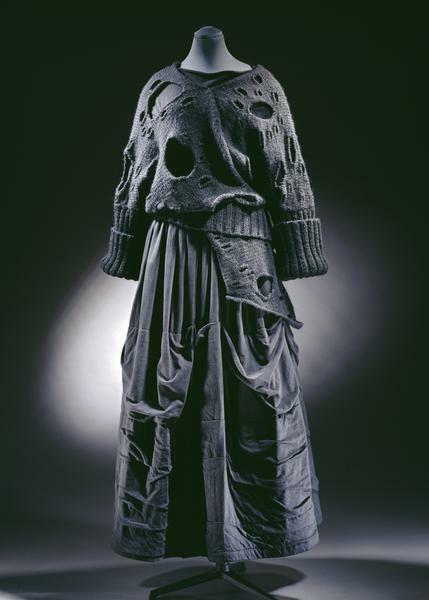 It consists of a black hand-knitted jumper decorated with randomly placed holes, giving it a post-Punk era feel and a black skirt of padded cotton jersey. 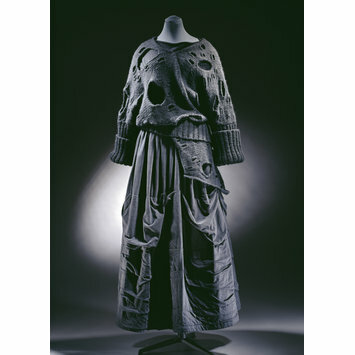 This outfit is typical of the predominantly black collections produced during the early 1980s by Rei Kawakubo. Jumper of black hand-knitted wool. Decorated with holes randomly placed. It uses an asymmetrical pattern and incorporates a deep welt that sits on the hips and gives form to the garment. The body is knitted in stocking stitch with holes placed at random to create a slashed effect. It is made in four pieces and seamed at the sides, shoulders and diagonally across the front and back. The sleeves and welt are ribbed. Registered File number 1984/ 2226. Part of an ensemble acquired together T.167 to C-1985. Mendes, Valerie. Black In Fashion. London: V&A Publications, 1999. pp. 106-107. The famous black 'lace' sweater is an immaculately hand-knitted pieces that uses the decorative potential of post-punk random holes. The designer (renowned throughout the 1980s as "the woman who took the colour out of fashion") has established an interplay of textures, blacks and shadows with the fine woollen undersweater; the 'lace' sweater and the sturdy asymmetrically quilted skirt in a deliberately washed-out shade of grey-black. Rei Kawakubo was one of the influential group of Japanese designers who opened up new avenues for Western dress in the late 1970s and early 80s. Many of her designs, notably this asymmetrical sweater, were rapidly 'borrowed' by down market manufacturers and within days appeared in high street shops. The body of the sweater is knitted in stocking stitch with holes placed at random to create a slashed effect. It is made in four pieces and seamed at the sides, shoulders and diagonally across the front and back. The sleeves and welt are ribbed. The full, ankle-length skirt, gathered into a narrow waistband, is made of a double layer of jersey fabric and quilted. The outfit is completed by a pair of walking style boots.